Was the ancient Maya tomb of Copán’s first queen looted “to order”? The looting of a spectacular Maya tomb only months after it appeared in National Geographic. Quite recently I had a stimulating email conversation with Sam Hardy and Peter Campbell. Sadly I had to mostly bow out of it as I was up to my ears in conference prep and Central America travel plans, but the topic has stuck with me. The three of us were discussing the idea of “looting to order” at archaeological sites. I highly recommend Sam’s post on the topic. It is a great read filled with much interesting info and several case studies. I was the most skeptical of the bunch, perhaps because I was employing an overly rigid definition. I tend to think “looting to order” means the constant, but unsubstantiated rumors about buyers selecting antiquities to be looted from photos of intact sites. These stories are always 2nd or 3rd hand and represent a sort of looter bravado that we all seem to want to believe. I tend to see theft as case-specific, and don’t quite see the utility of forcing a ‘looting to order’ label on a many unrelated cases. All that said, I was recently reminded of a case that some say represents ‘looting to order’. 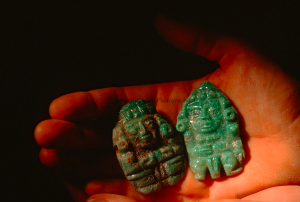 In 1998 the massive, beautiful Maya site of Copán, Honduras, was looted, seemingly by thieves who were working off of an issue of National Geographic. Yax K’uk’ Mo, with ‘goggles’. 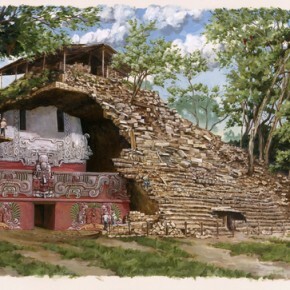 In 426 AD everything changed at Copán. K’inich Yax K’uk’ Mo, “Sun-Eyed Resplendent Quetzal Macaw”, a man from the far-away site of Tikal in Guatemala, arrived to found a dynasty. He became the ochk’in kaloomte, the “Lord of the West”, and his descendants ruled Copán for four centuries. 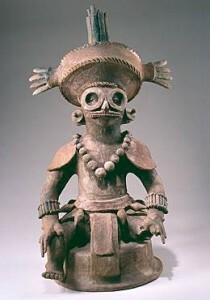 Yax K’uk’ Mo is one of the most recognizable ancient Maya rulers as he is always depicted wearing ‘goggles’: a headdress with loops around his eyes that recall Tlaloc, the rain god. When his tomb was discovered by archaeologists Robert Sharer and David Sedat in 1994, he was wearing the goggles. The body displayed battle wounds. Analysis of the bones shows that he spent is childhood far from Copán, supporting the written version of his ascent. This young fella buried at Copán is stealing Yax K’uk’ Mo’s goggle style. It is thought that, perhaps, Yax K’uk’ Mo conquered Copán by force, but there is some evidence that he also may have married into the weakened Copán ruling line. This was a standard Maya practice (as it is many places). The woman he married would have been locally very powerful. Yax K’uk’ Mo’s wife covered in bright red cinnabar. 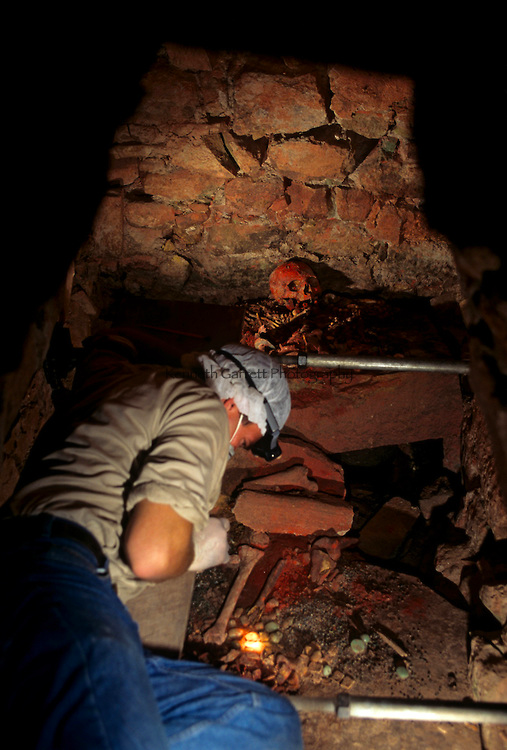 In 1993 archaeologists located a spectacular, rich tomb deep within several nested buildings in Copán’s acropolis. When the funerary slab was removed from the tomb, over 2000 ritual objects were found as they had been placed by the Maya. Jades, rings, baskets, pottery, mirror you name it…most displaying the unmistakable influence of the city of Teotihuacan in central Mexico. At first archaeologists believed that the tomb was that of K’inich Popol Hol, Yax K’uk’ Mo’s son and successor. However analysis of the remains soon revealed that the cinnabar and hematite covered skeleton was that of a woman. 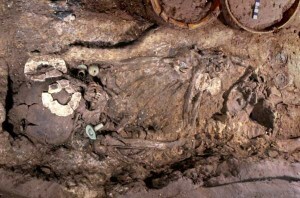 Due to the dating of the burial, its location, and how rich it was, the Margarita Tomb is thought to house the body of Yax K’uk’ Mo’s local wife. Her name is unknown but, like Yax K’uk’ Mo, she produced a line that would rule Copán through 16 generations. 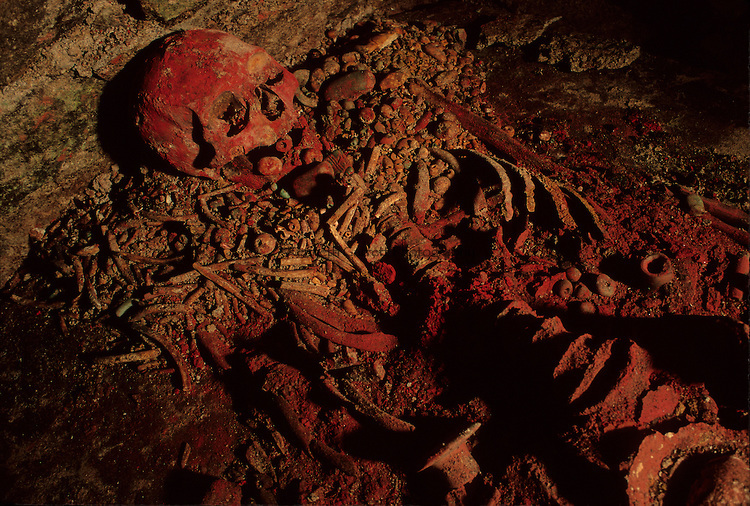 In December 1997 National Geographic ran an article by George Stuart entitled “The Royal Crypts of Copán”. Among the tombs pictured was the Margarita Tomb. This introduced (or re-introduced) the public to Copán and was the first glimpse most of the world had of the spectacular tomb finds of the preceding years. On 27 February of 1998, thieves entered Copán. They cut through several locked doors to reach an tunnel system that had been created by archaeologists to excavate the nested temples-over-temples that characterizes Maya construction over time. The thieves violated the Margarita tomb and looted a number of objects which had not yet been excavated, including five carved jades. Thankfully most of the contents of the tomb had been archaeologically excavated at that point and was being housed in a laboratory for conservation. Was this looting to order? Christina Luke (citing an article by Ricardo Agurcia Fasquelle in Mexicon that I can’t access) states that there is evidence that the Margarita Tomb looters were working off of what they’d seen in National Geographic only two months before. As the magazine featured images of the Margarita Tomb objects in situ, the thieves may have believed that they would find at least some of the funerary goods still there (…and they were). In this case it seems quite likely that the thieves selected their looting focus based off of what they saw in National Geographic. But the question still remains, is this “looting to order”? Luke believes it is, however I am not so sure. What evidence is there that some dastardly collector or dealer drew a big red circle around the Margarita Tomb images in National Geographic like it was a mail-order catalogue? Isn’t it just as likely (perhaps even more likely?) 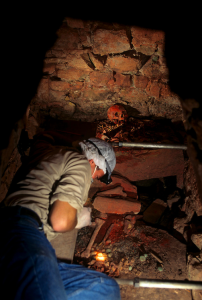 that a group of thieves in Honduras saw the National Geographic article and couldn’t resist breaking in to the tomb? It would be the equivalent of me posting a photograph of a stack of money on my table along with my street address and a note that I am just stepping out the door on twitter. And, yes, of course random thieves in Honduras look at National Geographic, especially when Honduras is featured. The looting of the Margarita Tomb was tragic. It showed that, really, no site is safe, even sites that are reasonably well-protected and well-excavated. We have seen this recently in the post-2011 looting of archaeological storerooms in Egypt, not to mention every museum robbery ever. Calling this looting to order or not won’t really change that. If anyone knows of any clear cases (not 2nd hand please!) of so-called looting to order, do get in touch.